THIS IS NOT, I REPEAT, IS *NOT* MATERIAL THAT I HAVE WRITTEN MYSELF, THUS PROPER CREDIT GOES TO THOSE RESPONSIBLE FOR THE ABOVE LINK. The Satellaview is a modem add-on for the SNES, released 1995, in Japan only. 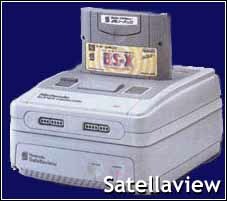 The Satellaview uses a Japanese satellite system called 'St. GIGA' to get it's information. With the Satellaview you can download updates of new games and get hot news, cheats, tips, demos, info about new Nintendo games, events or interviews, charts and rumors. A problem with the system was that you could only download a certain game, for example the new 'Chrono Trigger demo' when it was being 'broadcasted' at a certain time. You had to wait until a certain time or day to be able to download it (just like recording a TV-show from the TV). The things you downloaded could then be saved in a thing that you plugged into the cartridge slot that could hold 1 Megabit of data. This little thingies was called BS-X Special Broadcast Cassettes and looked like the Super Game Boy. It was only from 4 pm to 7 pm you actually could download stuff with the BS-X because at the other time of the day the satellite channel that the Satellaview System used broadcasted normal TV-shows! On the other hand everything you downloaded was for free. Nintendo managed to blend in some advertising to make it profitable. When it was released in 1995 both Konami, Square, Taito and Data East was planning to use the Satellaview for their advertising but the only two companies that actually supplied software for the St. GIGA channel was Nintendo and Square! The base unit had a 512 Kbit memory (RAM) chip to boost the SNES's capabilities and 1 Megabit ROM chip that contained the operating system needed to control the Satellaview. It also had a 256 Kbit flash memory if the user hadn't bought him/herself an BS-X Special Broadcast Cassette that contained a 1 Megabit flash memory chip. Here the "surfers" could check out previews and demos of new games. In this section you could solve Quizzes and play with other gamers in multiplayer games. I'm not sure if this section really existed because I don't know if the users could really upload data to the satellite. If they couldn't do that, it would be impossible to play multiplayer games over the BS-X! This section were packed with cheats, maps, tips and other relevant information on a bunch of different games. It's here you could find all the latest gossip, high scores etc. and if you were really lucky you might even find an exclusive demo or two!